an Internet connection, they work using the http/https protocols. link to files locally and not externally. greatly expedite me finishing this page. I truly appreciate it from anyone who can help. Just 'export your project to folder', and it works fine. Inside that folder every version ist numbered consecutvely with each export. conform to the standards but it is excellent software nonetheless. OpenElement can be quite confusing at times because it does not conform to the standards but it is excellent software nonetheless. Well, that's true. As a newcomer it would need some years to fully explore the capabilities. But the basic foundation gives a nearly instant access to create a very nice website, say in a week or so from scratch. And it's the good part, it does not conform to the standards - but still could, if required. The only thing I personally are sceptic about, is the output. That is really somehow 'strange'. Btw: you could transfer the locally created version up to the domain with an FTP (FileZilla) program. Watch to use the latest version of your output from OE. 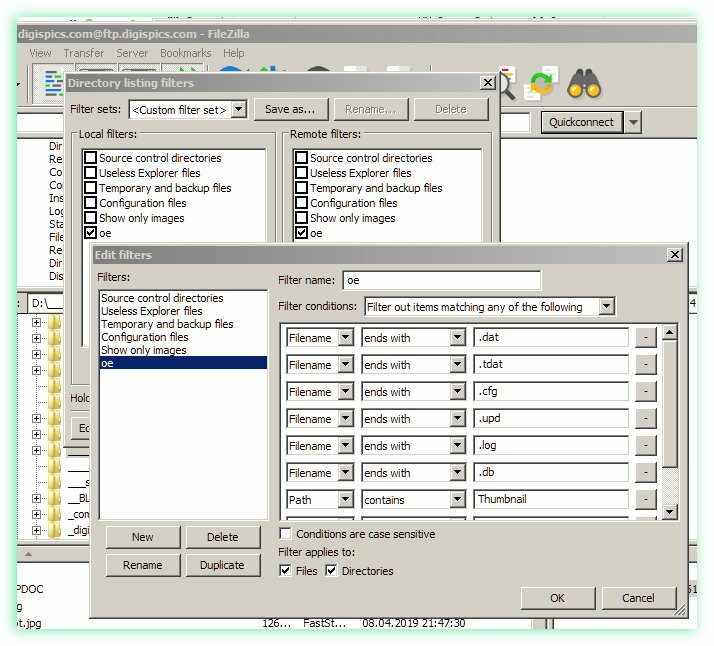 FileZilla gives the possibility to mask out certain file types (*.jpg, *.png) from transferring.